I am generally a glass half full type person when I write these posts but I have to confess that I am probably more of a glass-half-full-needs-to-be-poured-over-your-stupid-head type person in real life. Doesn’t that sound terrible? Probably because it is terrible – although for the record, I would never pour a half glass of anything over someone’s head. Depending on the contents (*lava*) I’m sure there would be litigation and jail time involved and while I think I’m funny, I don’t think I’m “handle prison time for an assault” kinda funny. I have a reputation for speaking my mind, I think that’s what I owe to people. I don’t try and be mean about it, I think I’m being funny. Surprisingly it doesn’t go very far endearing you to others. While this isn’t the specific house that “Nelson” and “Mary” were talking about, it’s pretty bad – it does look like someone broke this houses face with a poo-fist … or maybe it’s just me, because I am a total jerk. I’d say please enjoy! but if you like this house, I demand that you stop ready this blog. … really, I mean it. Look at how the brick and stone come together at the corner. That’s nasty. Three courses of brick, then some stone … then 6 courses of brick followed by some more stone – and then a whole mess of brick. It looks like tabs on a bend and fold paper house. The second window is glass block – which I have become famous for hating – and the top of the window is slightly above and into the soldier course of brick. It also has duct tape in the center which I am thinking is because they are having a hard time finding a glass block that will fit there. I could be wrong, we’ll just have to wait this one out. The top of the third window is slightly below the solider course. Of course it is … three different windows and three different conditions at the soldier course. The top of the fourth window has a different brick course layout all-together but there is still a little sliver of brick in place (look at the top left corner of the window) WTF! You will also notice that the new trim board (it is unpainted here) doesn’t line up with the existing brown trim board … why would it? pshhhaw – totally awesome in that it couldn’t be worse. 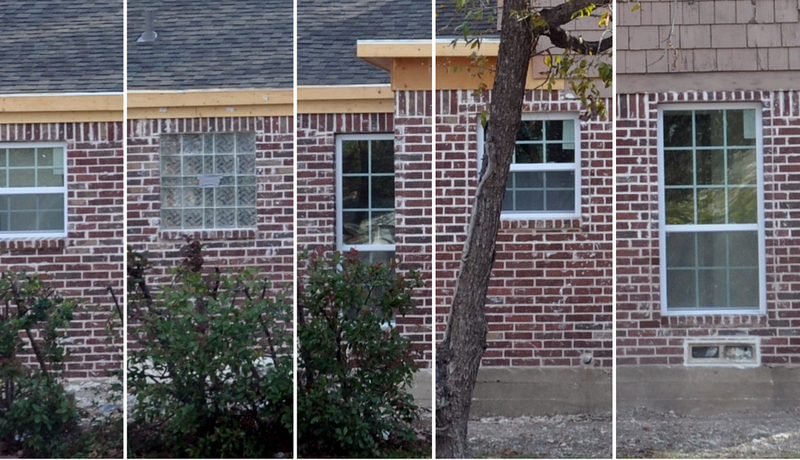 And now we are at window number five – yet again, completely different than the others. At least they took the time to center the foundation vent under the window so that it would look – wait a minute – NO THEY DIDN”T!!!! There are plenty of other things that the person who is renovating this house for resale is doing wrong, I just don’t see the need to continue pointing out anymore of them – it’s like kicking the dead. LEGAL NOTICE: by the way, the names here have been changed to protect the few people who actually talk to me in real life. Also, do NOT look up poo-fist on the internet **shudder** I may never recover.